Posted on October 5, 2018 by Joshua M.
The young cadet rubbed his eyes, jumped out of bed, and shook his bunkmate awake. CT-2224 slowly and methodically rolled off his bunk and dressed himself. Once 2224 was ready, the two clone youths jogged over to the training area. Their instructor, Bani, waited for them. The Duros was irritated. He made the two clones run laps until they were sweaty and miserable. Cody, or CT-2224, grumbled under his breath as they stepped into the sonic refreshers. Rex, who was designated CT-7567, was equally displeased. He knew they had gotten there on time. The eternally irate Duros always found something wrong. Their next assignment was their favorite: Battle training! As they hefted their mock blasters and blew holographic droids into oblivion, they joked and laughed. Battle training never failed to cheer them up. Rex especially loved using special tactics to destroy the fake droids, who always used the exact same formation and strategy. He had just attacked a huge wave when something hit him in the shoulder. He stumbled forward and whipped around. It was CT-6453. What a jerk. Rex always saw him around, bullying cadets and bothering teachers. Rex waved him off. Little did he know how important 6453 would turn out to be. The last assignment of the day was worse than PT: Galactic history. Their teacher was a hardworking taskmaster. The Kaminoan, Lima Bri, gave them tons of work and papers, and she never graded easily. Rex was feeling good about a report he had written about the moons of Io, but when he got it back Bri had given him only 75%. Cody was disappointed as well. His paper had received a 73%. They left class and headed back to the barracks to grab some sleep. Posted on August 2, 2016 by Rebecca V.
So, I was really disappointed when I read the end of Allegiant. I’m sure a lot of people were. I was almost in tears, and I threw the book across the room. (Never harm a book like that.) 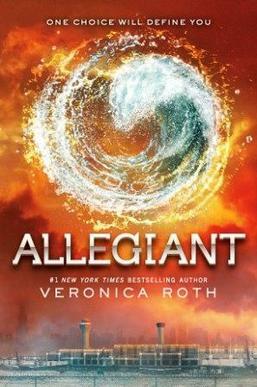 I don’t blame Veronica Roth for the ending, because I do think the Divergant series is well written. Instead of hating Roth forever, I decided to write a different ending. I’m not going to change every single chapter. Whatever page numbers I skip, it means that I’m keeping that part of the book the same. With all of what has happened to Tris, I don’t think she deserves to die. (Personally, I wished Peter would have died instead. He’s a total brat.) Anyway, this story isn’t about Peter. This is Tris’s story, with the ending she deserves. I start on page 455, where Tris is taking the backpack away from Caleb. “What, no! I can come a little bit farther with you,” I whispered back. “Tris. Please don’t make this harder than it is. Distract them.” With that, Caleb turned on his heel and sprinted down the hall. I can’t be breaking down and crying now. Instead, I point my gun at one of the guards and I pull the trigger. He goes down, clutching his shoulder in pain, but only one goes down to help him. The rest approach me, with their guns taken off safety mode. I brace myself to fight them fist to fist, but they just push me aside. I get knocked to the ground, and the last guard crushes my left hand. I’m sorry, Caleb, I think, as I struggle to breathe. I feel the small bomb go off. When I hit the ground, a searing pain goes up my spine. My eyes are starting to lose focus, but right before they close I can see Matthew and Cara towering over me, their expressions worried. I rounded the corner, and breathed a sigh of relief. Tris had an arm around Cara, her face wet with tears and blood, and her other hand clutching an ice pack to her side. Her facelit up when she saw me. I ran to her, and hugged her gently so Tris wouldn’t be in pain. I put a finger to her lips. But before I could speak, she moved my hand away. “Don’t try to silence me!” He’s my brother, and I should have gone in his place,” Tris said, and then broke down crying. This made Tris cry even harder. I shot Cara a dirty look as I led Tris to sit down. I hugged her and let her cry into my shirt. Minutes, hours, or days could have passed, but it didn’t matter to me. Days pass, as I try to cope with the grief. Sometimes I train, and sometimes I just sit there. Christina won’t hand around with me anymore. She told me, to my face, that she understands that I need a friend right now. Instead, she drifts away, not understanding how I can let my own brother die, almost in front of me. I don’t understand either. Cara’s been trying to help Peter, which I don’t know why. He’s just going to turn into that brat again, so why bother? Uriah is getting unplugged today. I walk silently, hand in hand with Tobias. Evelyn, Zeke, and Hana are there, but I don’t notice them. I can only focus on Uriah, my best friend. When the doctor starts flipping switches, I turn around. I don’t want to see another person I love die right before my eyes. We have to be brave in this world. Sometimes being brave can mean being selfless. Even though one choice can destroy a brother, another choice can avenge him. Between Tobias and I, we’ll avenge Uriah and Caleb’s lives. They will never be forgotten. I had to keep a record of what really happened. The people of Chicago deserve to know, if they didn’t know already. I’m training George’s police force, while Tobias is being an assistant to a politician. Tobias and I have a child, a beautiful baby boy. He’s about a year and a half years old, and is trying to chase his father on his short, chubby legs. I laugh as I write this, but also think of the memories. His name is Uriah Prior Eaton. His first name named after the first Uriah, and Prior for my brother. May they rest in peace. His last name is Eaton because Four thinks that his last name doesn’t remind him of Marcus anymore. I’ve gotten over the fact that Caleb has passed away, but I haven’t forgotten him. Life damages everyone, but we can heal.